Have you ever begged someone to share a recipe? I have ( a lot) and this recipe is one of those! At a Christmas party that I was a guest at year’s ago . . . way back when I could eat anything and still stay skinny, this delicious Creamy Veggie and Chip Dip was served. It was simply yummy upon first bite! I could have devoured the entire bowl and knew that I just had to get my hands on the recipe! This veggie and chip dip is so easy, it’s nearly stupid to make . . . and isn’t that just dandy at this busy time of year? Save the stress of making Beef Wellington for Valentine’s Day or some other special occasion. Prepare this dip in a snap and enjoy the extra freed up time with your family and friends. Now I have to warn you . . . this isn’t a skinny recipe! I suppose you can substitute lower calorie or reduced fat versions of the dairy ingredients, but I know the taste just won’t be the same. And after all the veggies make us feel better, don’t they . . . at least a little bit! I was given this recipe in 1979 by a friend in St. Louis at a holiday party. I’ve been serving it at almost every party I’ve given ever since. It never fails to receive rave reviews and requests for this super easy recipe! Blend all ingredients together and chill for several hours or overnight. This makes A LOT of dip and will be enough for a large group. I never tried cottage cheese in dip. Sounds delicious! Hi Cindy, yes the cottage cheese is what makes it! Hope you have a great SS! I bet the cottage cheese gives the dip an interesting texture. Sound good. The cottage cheese is what makes it so good. Thanks for stopping by Renee! That looks like a great dip, Roz. Thank you Angie! I hope you make it and enjoy it! Your presentation of the dip is beautiful! It was fun, especially since the veggies were so beautiful! Thank you so much Constance! I’ll be right by to see what you’ve been making on your blog! Wow! Your veggie tray and dip looks amazing! So perfect for New Years! Thanks Jennifer; I’ll be right over to see what you’ve been making! 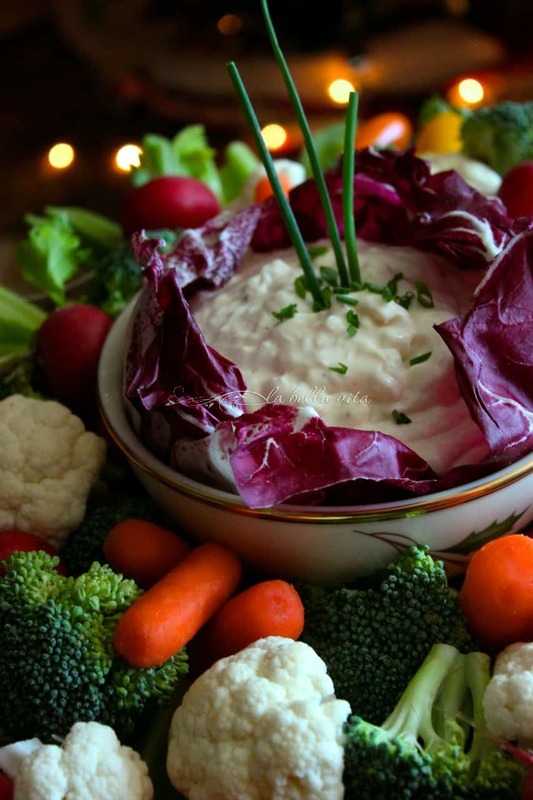 Roz – your dip looks beautiful and delicious. I remember carving out purple cabbages like that for dip presentations years ago. It takes me back, but the recipe is a new one to me. Great for New Year’s Eve. Buon anno. Yes, Linda, there s something about having a pretty presentation of foods! Buon Anno e tu! YUM! 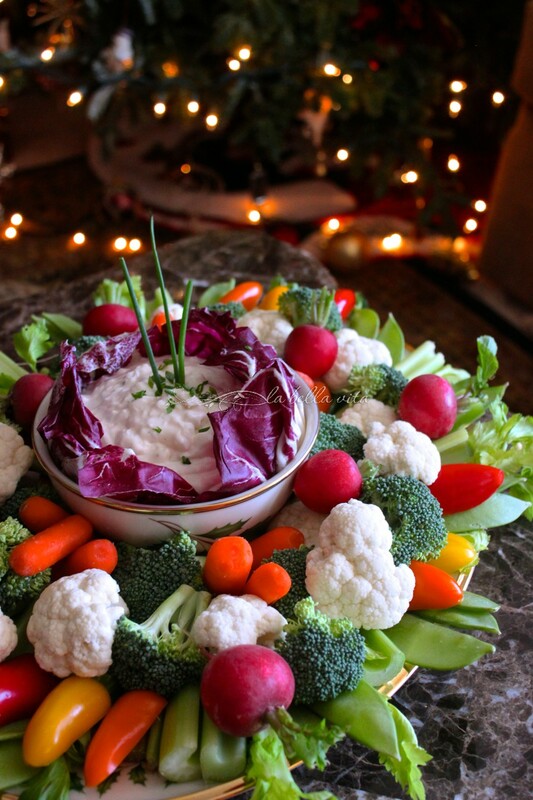 I love veggies and dip for all shindigs! Gorgeous photos! I want to reach through the screen and take a bit of the veggies and dip. I remember those days fondly of eating anything and staying a size 6, those were the days! Hi Christy, thank you so much for your visit and sweet comment! Hope your new year has had a great beginning! Very, very cool to use cottage cheese in the dip!!!! This is exactly what I’m craving this time of year! The cottage cheese adds a great soft texture to the dip. Thanks for stopping by and I wish you a wonderful 2015! Thanks Betty! I always appreciate you stopping by! Thank you Isabelle, I love Sunday Supper! Dip is something I crave veerrrry often. You can’t go wrong with a good party dip! Thanks Shaina, I have to say that I love it with potato chips too, but oh so bad for me! What a rainbow of delicious eating! Thank you MealDiva . . . wish there were some leftovers to nosh on for the rest of the week! All is well in my neck of the woods, thanks for stopping by at such a busy time of year! I’ll be right by! Sometimes the simplest recipes are the best! Love the cottage cheese in this dip. What a great way to get your veggies 🙂 Happy New Year, Roz! You got that right Susan . . . veggies are more inviting with a little dip! I love a good veggie tray and yours is beautiful. The dip sounds heavenly. Thank you Mindy! Hope you’re having a great start to the new year! This would be great for holiday parties! Love creamy dips like this! Thank you Julie, this one is a keeper (since 1978). I love vegetable platters, and make them often, but mine have never looked this beautiful! Also, this dip sounds way better than the store bought dressing I usually use. Especially like that it has both mayo and sour cream! Thanks for an easy recipe which is so great for busy times of the year. Thank you Shari. It’s a dip recipe from a dear friend and not my own. So good that I want to share it with everyone! 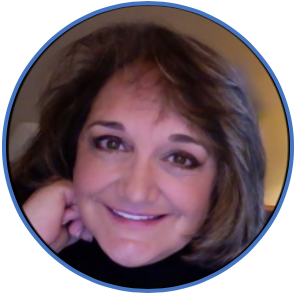 Thank you Mindy, this is a super fun and super easy appetizer to be creative in presentation!